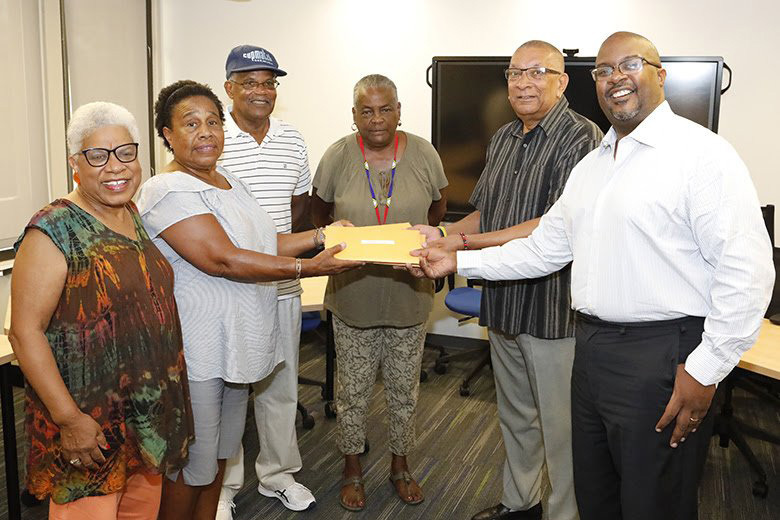 [Updated with copy of proposal] The Minister of Public Works Lt/Col David Burch and Minister of Economic Development and Tourism Jamahl Simmons “received a proposal for potential development” at Shelly Bay Beach from Laverne Furbert, Esme Williams, Cheryl-Ann Griffith and Allan Smith. The concept to add concessions at the Hamilton parish beach attracted some controversy, and the group opposed to the plan, which included the three people mentioned above, met with two Ministers, who said they plan to make recommendations to Cabinet. Speaking at a press conference earlier this month, Cheryl-Ann Griffin said, “We, the residents of Hamilton Parish and frequenters of Shelly Bay Beach present a plan for Shelly Bay Beach that we feel would be suitable for the entire Shelly Bay Beach and Park areas. “We believe that this plan would be more appropriate for Shelly Bay Beach as it functions in the community for residents and visitors and would enhance the experience of residents and visitors as they use Shelly Bay Beach and Park throughout the year. The proposal also mentioned the installation of additional toilet facilities, outdoor foot showers, a handicapped accessible personal changing room, plus a storage area for floating wheelchairs, rails and slings; and that the children’s playground could include installation of a wheelchair accessible swing and a wheelchair accessible merry-go-round. Keepin it all in da family… Horseshoe (for the big money) next? Maybe the Snorkel Park too? Somehow I sense just another scheme for these jokers to mess up and then blame it on you know who – pity the tax payers (who should be striking if this goes ahead). I hope the proposal includes maintenance and cleaning of public washrooms by anyone who wishes to be a vendor here. yes agree with the fast that i hope maintenance plans are on the table as well. What’s the betting this “proposal” gets accepted. They don’t even try to disguise it do they. It’s a done deal – very unfortunately. I hope the planners help to keep the beach tidy and CLEAN as most times it ISN’T! Recently we cleaned up Elys Harbour Public dock including many beer bottles it took 6 trash bags . Other locations needing T.L.C.are Mangrove bay and Rriddles Bay public dock . Put a casino there, oh wait. My question remains…where are all of the residents they are speaking on behalf of? I want to see the numbers that represent this proposal and vision presented by 4 members of Hamilton Parish. They claim the 1500 signatures on the petition, so while the title “RESIDENTS OF HAMILTON PARISH” etc may be over the top, this group clearly has major public backing. It is what it is. A complete waste of time and money! The beach is already accessible! Bunch of morons at work here! Ministers micro managing – friends & family plans are clearly back in vogue!! not every beach needs hamburgers sodas toilets and concrete, and more plastic! many resorts with vision and environment in mind actually stack old fashioned quality wood and canvas deck chairs…but given the complaining about the weight of chairs and heat a while back of one of the beach hands hired there i doubt they could handle them…much heavier. on that note, so pleased old fashioned bermy snowballs returned to john smiths. How many beaches has hamburgers and sodas? Horseshoe and ……… Tobacco Bay ………………. may be Clearwater and then Dockyard. And think about when you go on holiday – do you want to spend the day at the beach with no facilities. Do you pee in the sea? Nice! And your selfish response is, let the tourists visit Florida, Fairmont or the deck of their ship! WOW, just WOW. Clearly you are in a good, safe job with plenty of money coming in to support your family because obviously you don’t need to tourist dollar. And now the BTA is under siege from Government because they don’t like an independent authority bringing tourists to the island. Lets think about that for a moment. You claim the Government cares about the environment, tell that to the folks in Somerset who are going to have to deal with noisy air polluting ATVs shortly driving along the railway trail. You state that the BTA should focus on experience – what on earth do you think the plan at Shelly Bay was????? Seriously, you need to think what you are standing for because right now you are contradicting yourself. Huge blow to democracy. Surprised they didn’t have a golden platter for that proposal. Er …. transparency? What are the proposals? Why is everyone in this picture is so close to retirement age? Anyone under the age of 40 involved I this proposal?? Really need to consider what the future wants when you plan for the future. Are these four going to invest their own money into providing amenities at Shelly Bay beach like the other small businesses were or are they providing the Government with a shopping list to spend my and everyone elses tax dollars? We dont have pockets like Mr. Steinhoff When he spoke with the last government with his million dollar plan to take over Shelly Bay and turn it into something akin to Snorkel Park.You saw nothing wrong with that. You see nothing wrong with setting up repurposed containers, lounges, umbrellas, massage tables, paddleboars, motorized sea toys on a small popular public beach…known to be safe, especially for our children. You might also be reminded that the extravagent BTA setup would have been funded from your taxpayer dollar…including startup finances for the businesses…. but a mere proposal that promises to cost measurably less plus promises to protect our environment, cater to tourists and residents who appreciate the natural setting, makes accommodation for the disabled and appreciates unique beaching culture…you have a problem with. But I guess we won’t see it because Ne Steinhoff was not the right ‘type’ to get it through. Hope you have money to fund this alternate plan as I will march against it! I saw that plan, and it was nothing akin to Snorkel Park. The plan included renovating the existing building and a parking that was scrapped. A restaurant, entertainment within the existing footprint of the building and beach concessions. Mr Steinhoff was investing his own money with a plan that added to the beach. The difference is, C. Griffin, that the BTA’s investment would have seen some return in the form of rental from Mr Steinoff and the small business owners plus an increased tourist presence which would have turned into $$$ for Bermuda. And no, I don’t see anything wrong in setting up loungers, umbrellas, massage tables, paddleboard, motorized sea toys or repurposed containers at the beach. I went past there over Cup Match and there was loungers, umbrellas, paddleboards, motorized sea toys, boats, and kite surfers all there, with children!!!!!! The only thing missing was the massage tables and the repurposed containers which I saw at Cross Island during the Americas Cup and were very tasteful, I doubt either of those are a threat to children’s safety. So again, what I have a problem with is that your proposal is how the Government should spend my money catering to YOUR needs without any thought to return on investment. My guess it will be the latter not the former. We are already paying taxes. The BTA would have provided start-up funds using tax payers dollars. A complete and utter lie! Do you have any shame at all? No. No she doesn’t. And never has. So are we- to keep your moronic Ministers employed cause we all know they could hold a legitimate job. And to think the plp preached transparency..
PLP speak out of both sides of their mouth. Can’t trust them. From the outset the Shelly Bay objectors have been propagating the false claim that the BTA’s proposal would deny Bermudians access the beach. They continue to enforce this false claim with their latest comment: “it is our view that Bermuda would benefit from a beach that is accessible to all Bermudians…”. This implies that Bermuda would not have benefited from the BTA’s proposal and that somehow their plan would have rendered the beach less accessible for disabled Bermudians and visitors. As a resident of Hamilton Parish, I had no objection to the BTA’s temporary proposal to stimulate some economic activity on the beach. But I also agree that Shelly Bay beach and all of Bermuda’s beaches, should be more user friendly to people with disabilities. But the two ideas are not mutually exclusive. There was no need for the objectors to distort the facts to get their way. I find it interesting that in the beginning the Tourism Minister was on board with the BTA’s plan but then all of a sudden he makes a u-turn. I just hope that this move by the government is not part of a hidden agenda to do away with the BTA altogether. It’s no secret that the PLP was initially not in favor of the creation of the BTA. It will be very interesting to see what finally comes of empty lot that once occupied a restaurant and restroom facilities for beach goers. Clearly something happened that Thursday that got Mr Simmons to switch up things. Was it the involvement of Mr Burch, who knows. What’s a bit concerning is Mr Burt laying down the lines that the BTA answers to the Ministry. He chose this time to lash the BTA when the BTA were under the assumption that their Beach Vision was approved and cleared. I agree with the group’s proposals–which aren’t many and certainly not unreasonable, plus all beach users stand to benefit. An attractive lunch wagon would do just fine and will only be on site at the commencement and culmination of our summer season. Just as long as you discourage those “people” with their “mental illness”, eh Peggy? The group are opposed to three containers on site. I support them in this regard as well. Just picture those unattractive, cumbersome and oblong shaped metal vaults obscuring the natural picturesque views of the horizon, sea and sand. Peggy, aren’t you that sign lady? You should take a look at “The Gulf” restaurant in Orange Beach, Alabama. Re-purposed shipping containers can look very attractive. There is nothing progressive about this. What a bunch of backward looking hogwash. Do we or don’t we want to be an international tourism destination? Old one foot in the grave and the other almost in! No progress for Bermuda because of people like YOU! I am going to sell banana’s there from my boat. Anchored 20 ‘ from shore. This is one of the reasons why progress is so slow on this Island. Too may old conservative people who hate change, calling the shots for the next generation. Did they budget for the big sign keep tourists and non-Koolaid drinkers out? bet the taxpayers paid for the coffee and snacks you inevitably had during your staged presentation. Surprised the Major General Cornel stayed awake. Well Laverne has put it forward so don’t dare let government turn it down, the whole island will shut down. Have a nice day!!!! The traffic modification may be the most difficult part of this. Not much room to do much more than a basic lay-by. Why is every body involved with other domestic fancy projects which can wait, we have managed so far with out. Where are and what are the national priorities. You can learn alot from birds, who build the nest first. The number one prority is the national debt, money is leaving this island by the truck load. But first we need to improve our social well being , you know what I mean ! Make nice ! Who wants to come the to an island in turmoil. We have to make money with money it is called currency exchage. We all live off the skin of the rice pudding ,the Bermuda income of cash is a revolving door it comes in and goes out all in the same day. Bermuda the country does not have a living wage much less trying to help others. In order for Bermuda to pay our national debt we need foreign exchange and lots of it, our creditors don’t want our cash. The Bermuda Government Monatary Authoity controls the cash flow and revenue. Why can’t we sell our visitors a Bermuda Dollars Credit cards or straight up CASH at the arivals air port to pay ALL their bills during their stay. Go any where else you have to convert to their currency. The people who want to run this island need to stop holding this counrty to ranson. Go for it Peggy. With these lot we’ll be eating from a tin can and making shoes from used tires soon enough. And we all know “your Bermuda” does not include all Bermudians. How do plan to achieve that ?